Because I am not a Registered Design Professional, I can’t engineer your new post frame building for you. And, if I was, I most certainly would not be doing it for free. 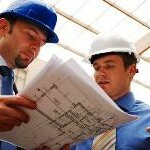 Typically an engineer should be compensated somewhere in the area of 8 to 12% of the value of the project, depending upon how involved they have to be with it, as well as if a visit (or visits) to the site are included. “Mike, Thanks for getting back to me. That doesn’t surprise me!! Questions: 1) My barn will be 44’x32′ x15′ wall height with the trusses running the 44′ way. What size of holes do I need to bore for my post anchors? I’m not barring my post, pouring concrete to the top with 18″ tall “U” brackets made from 1/4″ plate and (4) jay hooks 18″ long on the bottom of brackets that will be in the concrete 18″s. Also what size header do I need on the truss support side if I install trusses every 24″ with plywood and shingles with A 16′ oh door opening . ( Wanted to match my existing garage roof.) I will be tying the new barn to the existing garage on one end. If not a good idea what header to use with trusses at 8′ and wood purlin and metal roof? Let me know if you need any more info. Thanks for your help. Dirt is clay and figured at 3-4K in my area. You are asking questions of me which should be directed to the RDP (Registered Design Professional – architect or engineer) who designed your building and provided the plans. These will include the foundation design as well as any truss carriers. Some commentary – there are wet set brackets made specifically for post frame buildings. I would recommend you invest in them rather than trying to fabricate (or have fabricated) your own, unless they were designed by your RDP and inspected by him or her after production. For Clay soils, the Building Code allows a value of only 1500 psf – any greater values should be used only if an onsite soils test has been done by a registered engineer, else you are at risk of settling issues. See Table 1806.2 https://codes.iccsafe.org/public/document/IBC2015/chapter-18-soils-and-foundations. 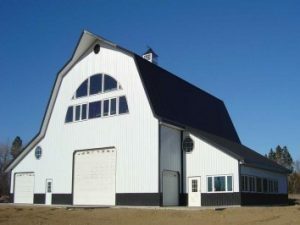 If you are not too deep into your project and do not have an RDP involved, I would strongly encourage you to deal with a post frame building kit supplier who can provide engineer sealed plans and calculations for your building, along with the materials to assemble it and complete instructions. This entry was posted in Pole Barn Questions, Pole Barn Design, Building Department, Pole Barn Planning, Pole Barn Structure, Trusses, Footings and tagged wet set brackets, registered design professional, post frame building kit, truss carriers on June 8, 2018 by admin. 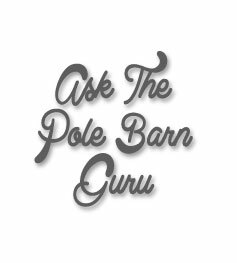 DEAR POLE BARN GURU: As a licensed Real Estate agent and looking to move, I realize how crazy the market is (at least in Michigan and the Grand Rapids Area). 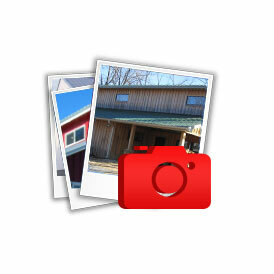 Considering building a pole barn home for my wife and I when we sell our house, however what about resale value? My concern is regarding appraisal or the possibility of having comparables should we need to sell after we build. At best I could think of manufactured, but that would depend on what the building is “labeled” as. Speaking to a professional lender he seemed convinced that I would HAVE to have a cash buyer, or someone doing a portfolio loan at 15% down. 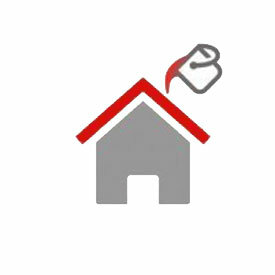 Do you know of anyone who was able to sell their pole barn house with financing, and if so, what did the appraiser use as their comps? DEAR GAGE: Post frame homes will have the same value as a comparably sized and featured stick built home. Think of it from this aspect – both have permanent foundations, both are constructed onsite out of wood framing. The structural system is “wood framed”. Period. When you (or a buyer) go to get a loan, remember to use “wood framed” otherwise you will entirely confuse the lender. For comps, your appraiser will be looking at other similar sized and featured wood framed homes which have sold recently in your area. I cannot vouch for people selling their homes with financing, however I financed and refinanced my own home and with two very elaborate post frame accessory buildings (both of which are livable spaces). Through three appraisals, never once did the question of post frame come up. DEAR POLE BARN GURU: Wondering if you can place the 6×6 pole onto a concrete foundation with brackets that hold pole to concrete? DEAR JOE: Yes, it can be done, provided the 6×6 is adequate to carry the loads being imposed upon it. Here is information on the brackets: https://www.hansenpolebuildings.com/2012/09/concrete-brackets-2/. and cobble job of rigid foam (1 inch) . My idea is to use 7/16 osb to finish inside and Maybe add sheetrock at some point- my concern is the support of interior walls-do I just let the wall girts carry the load or do I figure a way to anchor into posts? Thanks very much, Robert in Middletown. DEAR ROBERT: Not sure why you would want to go to the added expense of placing OSB on the inside and then later adding gypsum wallboard, other than your post frame building frame may have too much deflection to prohibit taped drywall joints from cracking. Before adding GWB (gypsum wall board) you should verify with the engineer who designed your building to make sure it is adequately rigid to be able to support it. If you are unable to contact the engineer, then you should consult with a RDP (Registered Design Professional – architect or engineer) who can confirm it is adequate, or recommend a fix or fixes if it is not. Once you know all is good, a set of girts should be attached to the inside of the columns to support the GWB. 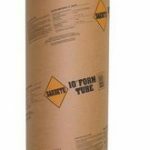 This will also create an insulation cavity where you can add fiberglass batts or even better – do BIBs (information on BIBs here: https://www.hansenpolebuildings.com/2011/11/bibs/). This entry was posted in Pole Building Comparisons, Pole Barn Planning, Footings, Building Interior, Columns and tagged wet set brackets, drywall, Post Frame house value, Post brackets, Design help, shear wall, gypsum on May 1, 2017 by admin. Dear Pole Barn Guru: Can I Use Concrete Brackets with a Foundation? New! The Pole Barn Guru’s mailbox is overflowing with questions. Due to high demand, he is answering questions on Saturdays as well as Mondays. DEAR GLIDING: You’ve caught me! So many topics to write about, and just not enough days of the week to post them. I’ve just returned from the 2014 Frame Building Expo, where Schweiss Doors (https://www.SchweissDoors.com) was one of the exhibitors. Keep a watchful eye open, as I will be writing about their products and other hangar door options in the very near future. This entry was posted in Uncategorized, Pole Barn Questions, Concrete and tagged wet set brackets, concrete brackets, bi-fold doors, dry set brackets, Schweiss doors, sliding hangar doors, stack doors on April 5, 2014 by admin. Ask The Pole Barn Guru: Where Can I Buy Concrete Brackets? 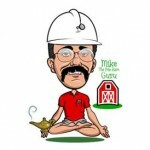 Greetings…and WELCOME to my new blog Feature – Dear Pole Barn Guru! Starting today….each Monday I will post questions submitted to me about pole buildings and pole barn construction, products for use in pole buildings, along with my answers. 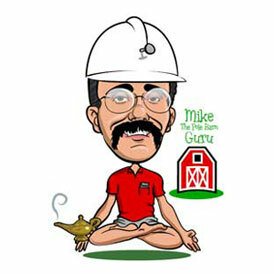 Scroll to the bottom if you have a burning question for the Pole Barn Guru, and look for the answer in an upcoming Monday segment of Dear Pole Barn Guru. DEAR DETACHED: There are numerous brackets to attach pole building columns to concrete foundations. We’ve found only one which is capable of withstanding the moment (bending forces) which are introduced into the building columns by the wind. Contact Eric at Hansen Buildings (866)200-9657 for delivered pricing on concrete brackets. DEAR FLAT: If the pole building has a door or doors tall enough to get the premix truck inside the building, I prefer to have all of the roofing and siding on. This allows the pour to be done, without the threats of weather (baked by the sun, or whipped by winds which cause curing too fast, or rained upon). If this is not possible, at least have the building roofed, prior to the concrete floor being poured inside a pole building. For some reason, when slabs are poured with only the columns set and the pressure treated splash planks (splash boards) installed, the columns tend to grow bull’s-eyes (which are seen only by pre-mix trucks). More than once, I’ve had a column knocked out of plumb by a truck during the pour. As to whom? I personally have an aversion to finishing concrete. If this is outside of your skill set, most pre-mix companies can furnish a list of finishers who service your area. My recommendation is to always purchase the pre-mix yourself and pay the finisher only for labor. I’ve seen estimates of 40-50 square feet of finished floor per finisher hour. This feels very low to me, as I know of several finishers who have no problems finishing 800-1000 square feet in a day by themselves. While flatwork is hard work, I’d have a hard time paying more than about 50 cents per square foot in labor costs. DEAR DIGGING: In an ideal scenario, holes are augured into the ground (in most cases a skid loader with an appropriate diameter augur bit will dig them), the pressure preservative treated timber columns are placed in the holes and then pre-mix concrete is poured to flow both below and around the columns. This is going to be the least expensive and most structurally sound scenario. Temporarily nailing a couple of 2×4’s horizontally to the post will help to keep the columns at the required distance “floating” above the bottom of the hole until the concrete is set. Alternatively, the holes could be completely filled with pre-mix and engineered wet-set brackets are placed in the concrete to mount the columns to. This entry was posted in Pole Barn Questions, Concrete and tagged wet set brackets, concrete floor, concrete slab, Mike the Pole Barn Guru on February 25, 2013 by admin. Concrete is poured for a new building. Plans change – it is now going to be a pole building. Now what do we do? Or, for whatever reason, you just do not feel comfortable embedding pressure treated wood columns in the ground for your new pole barn. For both circumstances, there is an answer. Concrete brackets are available which have been specially designed for the post frame industry. 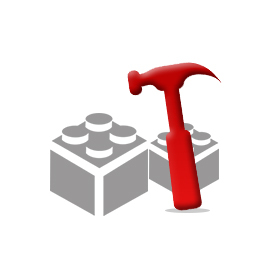 These provide solutions for already poured concrete, or concrete yet to be poured. The brackets are made with a high strength, low alloy domestic steel. The 1/4” steel plate is robotically welded insuring the highest quality. Most current generation pressure treated wood available today is designed to minimize corrosion. All concrete brackets are finished with a baked polyester powder coat to prevent corrosion, resist UV damage, and provide a professional look to your project. However, if you have a high moisture application or are concerned about possible corrosion, place a barrier between the treated wood and steel bracket, and use stainless steel fasteners. Drill-set installation with steel concrete brackets is useful in situations where the concrete foundation has already been poured. One of the main advantages of this type of install is the reduction of placement errors when a concrete subcontractor is used. 5/8” x 5” screw type wedge bolts are preferred for the attachment of brackets to concrete, because of their optimal performance. Two other common fastener options which can be used are epoxy anchors and expansion anchors, either of which can be obtained from local suppliers. Wet-set (poured into the concrete) brackets are the preferred installation method. They provide for maximum shear, uplift, and moment capacities when compared to the standard drill set brackets. The special grade ½” or 5/8” rebar used in the wet-set models is seismic rated. Custom sized concrete brackets to fit odd sized columns, such as glue laminated, are not currently available. However, universal one sided drill set brackets are designed to be paired together to fit any sized column while still providing the shear and uplift values as the wet-set models. While the brackets do not currently have an International Code Council (ICC) Evaluation Report, design values have been certified by a registered professional engineer. If your vision of your ultimate dream building has columns which are to be mounted on top of concrete, Hansen Buildings has the design solution for you. This entry was posted in Building Styles and Designs, Pole Barn Planning, Pole Barn Structure and tagged concrete foundation, drill set concrete brackets, wet set brackets on January 10, 2012 by admin.